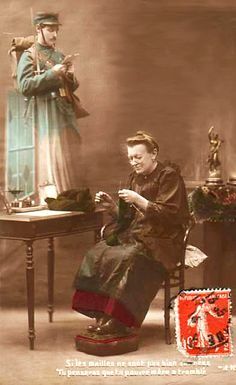 During the First World War women in kitchens and parlors in homes throughout Newfoundland and Labrador were enthusiastically knitting goods, especially socks for the men who had signed up to fight for King and Country. Many of these women were members of the Woman’s Patriotic Association (W.P.A.) an organization of more than 15,000 women from throughout Newfoundland and Labrador. The socks that were knit were intended primarily for the men of the Newfoundland Regiment but there is evidence that soldiers from other countries including some from Ireland were the beneficiaries of the woolen socks. In January of 1916 Mrs. Margret Morris of Long’ Hill, St. John’s was thrilled to receive a letter from an Irish Soldier thanking her for socks which he received ‘Somewhere in France’ and found to have been knitted by her. The 85 year old Mrs. Morris was so delighted with the letter of thanks that she strolled down to the offices of the St. John’s newspaper the Evening Telegram to have her story published. “Mrs. Margaret Morris an old lady of 85 years has received a letter from an Irish soldier thanking her for socks which he received and found to have been knitted by her. His name is Private B. McCourt and he is with (British Expeditionary Force) B.E.F. in France. The old lady was delighted to receive the letter and hopes to get another from him as he asked her to write to him. He thanked her for the socks she had knitted, said how glad he was to get them and expressed much appreciation at receiving a pair knitted by an aged person. The practice of slipping a note in the toe of the socks that they knit with their name and address as well as a prayer for their soldier boys was well established among the Newfoundland knitters. Those receiving the socks with the notes were often gracious enough to return a note of thanks. It is not likely that the old lady did receive any other correspondence from her Irish soldier, she died on March 8, 1916 at her residence on Long’s Hill just a few weeks after the initial letter from him. This entry was posted in Archival Moments and tagged comforts, Ireland, Regiment, socks, soldiers, WPA on January 26, 2019 by Larry Dohey. A paper-mill timekeeper in the company town of Grand Falls, George Goudie was 18 when he headed to St. John’s to enlist in the Newfoundland Regiment in March, 1916. By the following spring, just a few kilometres south of the fighting at Vimy Ridge, Corporal Goudie’s unit attacked the German lines in the Battle of Arras – and were met by a brutal counterattack. The regiment had gone to battle with 521 men; it suffered 487 casualties. Cpl. Goudie was reported missing. This entry was posted in Archival Moments and tagged Blue Puttee, Death Penny, First 500, First World War, Goudie, Great \war, Moore, Regiment on November 10, 2018 by Larry Dohey. Fish and Brewis served to the Newfoundland Regiment in the trenches of France. “Fish and Brewis” has long been one of the most common meals served in Newfoundland and Labrador and during the First World War (1914 -1918) Newfoundlanders were determined to see the meal served to the ‘boys’ of the Newfoundland Regiment. The people of the Dominion of Newfoundland were so resolute that this Newfoundland delicacy be available to their ‘soldiers boys’ in the trenches of France that a “Fish and Brewis” Fund was established to purchase and send overseas the two main ingredients, dried cod fish and ship’s biscuits. Fish and Brewis (pronounced “brews”) is a combination of salt cod and hard bread, which is a small, compact cake, made with flour and water and sometimes called “hard tack.” The dish is frequently sprinkled with “scruncheons,” which are crisp fried bits of salt fat-back pork, and the scruncheons are sometimes fried with onions. Recommended Cook Book: Edward A. Jones spent decades sampling and lovingly collecting salt cod recipes from around the world. The result is Salt Cod Cuisine: The International Table, 2013 a remarkable collection of 250 step-by-step salt cod recipes that celebrates salt cod and its place in world history and culture. This entry was posted in Archival Moments and tagged chefs, cod, cooks, fish, food., Regiment, War on January 17, 2018 by Larry Dohey. A replica of a Nieuport 11 French single seater First World War fighter plane has landed at The Rooms. This plane was part of the “Birth of A Nation” tour, spanning the country from coast to coast, commemorating airplane heroes of the past 100 years. This bi-plane was one of the aircraft that flew as part of a commemorative flight over the Vimy Memorial on the hundredth anniversary of the battle – April 9th, 2017. This aircraft also flew over Beaumont Hamel Memorial Park. Join us as at The Rooms as members of the team that flew the Nieuport 11 talk about their experience at Vimy and Beaumont Hamel and the place of flight in our First World War history. Vimy Flight: Premier public showing of the documentary “Flight Path of Heroes”. Flight Path of Heroes: Connecting the Past and Present is the third in a trilogy of documentaries called A Nation Soars: Commemorating Canada’s Great War Flyers. In this third instalment, narrator Dan Aykroyd tells the incredible story of a present day FWW squadron who travel to Vimy France, during the 100-year anniversary of the Battle of Vimy Ridge, to perform a historic and patriotic flyby over the Vimy Memorial. At home or at the front, music uplifted spirits, boosted morale, and became an overall important part of life during The Great War. Come join Bill Brennan with vocalists Shelley Neville and Peter Halley as they perform some of the most popular songs that were heard in music halls, pubs, tents, dug outs and trenches. The Rooms Will Be Closed On Saturday November 11 in observance of Remembrance Day. At 10:55 a.m., His Honour (Honourable Frank F. Fagan and Her Honour Patricia Fagan) will attend the Remembrance Day Ceremony at the National War Memorial where His Honour will lay the first wreath. Her Honour will lay a wreath on behalf of the Women’s Patriotic Association. Following the Service, His Honour will take the Salute in front of the Court House on Water Street. At the conclusion of the parade, Their Honours will host a Reception at Government House for invited guests. At 2:30 p.m., Their Honours will attend the Annual Service of Remembrance at the Caribou Memorial Veterans Pavilion. This entry was posted in Archival Moments and tagged Flight, Memorial, Regiment, song, War on November 9, 2017 by Larry Dohey. Photo Credit: The Rooms Provincial Archives: A 58-52; N.F.L.D. 1st Regiment Camp [Pleasantville], St. John’s, NL. In September 1914 Pleasantville was the site of a number of ‘Smoking Concerts’. One of the entertainments that was held for the young men in the camps at Pleasantville, near Quidi Vidi Lake, St. John’s in September 1914 were the ‘Smoking Concerts’. The young men in the camps at Pleasantville were the first recruits for the Newfoundland Regiment. They were training to prepare to fight for ‘King and Country’. Originally the term ‘Smoking Concert’ referred to live performances, usually of music, before an audience of men only; popular during the Victorian period. At these functions men would smoke and speak of politics while listening to live music. In Newfoundland and other places by 1914 the smoking concerts were much less formal; they were not so much about discussions about politics but evenings of song and recitations. In St. John’s, one of the locations for the ‘Smoking Concerts’ was at the ‘mess tent’ on the Pleasantville grounds. There are reports that as many as 400 men would gather under the tent for the entertainment. One of the local celebrities that could be found, on a very regular basis at the camp, playing the piano for the ‘Smoking Concerts’ was Charles Hutton. Hutton was a leading figure in Newfoundland musical activities, he was the owner of Hutton’ Music Store (that was later taken over by his sons) and his wife was a celebrated classically trained singer. Hutton would play for many of the men who would come forward to sing their ‘party pieces’. The evening would include solos, storytelling, musical recitations, and instrumental numbers. The evening would always close with the singing of the National Anthem by the entire gathering. Imagine, 103 years later the Iceberg Alley Performance Tent, has replaced the performance tent of the Newfoundland Regiment. At Quidi Vidi Lake and the party continues! This entry was posted in Archival Moments and tagged Concert, Pleasantville, Quidi Vidi, Regiment on September 16, 2017 by Larry Dohey. This entry was posted in Archival Moments and tagged comforts, Ireland, Regiment, socks, soldiers, WPA on January 26, 2017 by Larry Dohey. A dark pall of sadness hovered over St. John’s on January 2, 1915 with news that “the first name was recorded in the Immortal Honor Roll of the Newfoundland Regiment.” The name of the first Newfoundlander, to die as a soldier in the service of this country, one of the First 500 was Private 584, John Fielding Chaplin. Chaplin had arrived at Fort George, Scotland with the Newfoundland Regiment on December 8, 1914. Note: John Chaplin’s official Regimental Record states that he died on January 1, 1915. Governor Davision writes December 31, 1914. Recommended Reading: Christopher Morry’s : When the Great Red Dawn is Shining: Howard Morry’s Memoirs of Life in the Newfoundland Regiment — 11 Platoon, C Company, RNR. Breakwater Books, St. John’s, 2014. This entry was posted in Archival Moments and tagged Chaplin, Davidson, First World War, Regiment, soldier, War on January 2, 2017 by Larry Dohey. In the trenches ‘Seal skinned boots’ offered the best possible protection against trench foot. Twenty (20) year old Eugene had died in action in the trenches of France a few months earlier. When he was writing the letter Frederick Harris was not aware that his other son Clarence had also died. News had not yet reached the family. Two of his sons lay dead in the trenches of France. The Harris family like thousands of other families in Newfoundland upon hearing of the death of their sons were determined that if their child was to be buried in foreign soil that the grave be a respectable plot and well maintained. It was the prayer of this grieving father that the sale of the seal skinned boots would help in some small way to offer this dignity. The only remembrance that the families had of their “soldier boys” was a photo of the grave that was hung in an honored place in the household and the few contents of the package of effects that was sent to them. The men of the Newfoundland Regiment that fought in the trenches of France in the Great War suffered prolonged exposure of the feet to damp, unsanitary, and cold conditions that often lead to ‘trench foot.’ It was not unusual for young soldiers like Eugene Harris to write home and order ‘seal skinned boots’ that offered the best possible protection against the wet and cold. The sale of Private Eugene Harris’s pair of seal skinned boots at the request of his father was one of the many acts of generosity shown by Newfoundlanders that would eventually see the erection of memorials in France and communities throughout Newfoundland and Labrador. Archival Exhibit: The Trail of the Caribou in Trench Maps: Level 3, Inside Archives Reference Room. The Rooms Provincial Archives collection of trench warfare maps provide researchers with an opportunity to learn more about our long and rich military history and the important role Newfoundland troops played during the First World War. This entry was posted in Archival Moments and tagged Glovertown, Great \war, Regiment, seal boots on May 15, 2016 by Larry Dohey. Photo Credit: The Rooms Provincial Archives: F25. Newfoundland soldiers wearing “woolen helmets.” Can you identify any of these Newfoundland soldiers? The men of the Newfoundland Regiment have long been known as the ‘Blue Puttees’ because of the distinctive “blue leggings” that they wore on departure from Newfoundland to fight in the First World War. On arrival in England in October 1914, the blue leggings (puttees) were replaced by the standard khaki leggings but the Newfoundlanders continued to differentiate themselves by what they wore, their “woolen helmets”. On arrival in England in October, The Newfoundland Regiment many wearing their knitted toques were at Salisbury Plains, England for several weeks, then they went to the Seaforth Highlanders at Fort George, Inverness, Scotland; from there they were transferred to Edinburgh Castle. It was the first non – Scottish regiment to do so. It was a very prestigious assignment. The “woolen helmets” were in fact Newfoundland knitted toque’s. “The advance party of a Newfoundland Regiment has arrived at the (Edinburgh) Castle and their advent to the city is of more than passing interest. The members of the advance party of the (Newfoundland Regiment) are a fine looking well set-up and stalwart body of men and with the exception of their headdress which is of a knitted khaki-colored material there is nothing to tell of the difference between the British Regulars and Territorials and themselves. Photo Credit: The Rooms Provincial Archives: A 97-5. The Regimental service hat with the caribou pin was introduced in 1916. Can you identify any of these Newfoundland soldiers? The “woolen helmets” or “knitted toque’s” may have been considered quaint and distinctive by the Scottish locals but the young Newfoundland soldiers were quite embarrassed by them. They were looking forward to receiving their Regimental caps that would arrive a month later. The “woolen helmets” were soon displaced by the “caribou cap badge” forming one of a number of regimental identifiers worn by the men of the Newfoundland Regiment. Definition: Benedict, a newly married man who was previously considered a confirmed bachelor. [After Benedick, a character in Much Ado About Nothing by William Shakespeare.]. Recommended Archival Collection: Patriotic Association of the Women of Newfoundland Description number MG 842.5 This file consists of printed publication prepared by Women’s Patriotic Association (WPA), with introduction by Lady Margaret Davidson. The publication includes instructions for knitting home comforts and convalescent clothes for soldiers. Recommended Exhibit: At the Rooms: The Newfoundland Regiment and the Gallipoli Campaign: At the Rooms Level 3, Archives Reference Room. “That there can be no higher praise!” This exhibit commemorates the 100th anniversary of the Gallipoli Campaign in 1915, where members of the 1st Newfoundland Regiment experienced their baptism by fire and saw their first combat casualties. Lantern slides, photographs, maps and documents provide insights into this ill-fated campaign. Recommended Reading: Christopher Morry’s: When the Great Red Dawn is Shining: Howard Morry’s Memoirs of Life in the Newfoundland Regiment, 11 Platoon, C Company, RNR. Breakwater Books, St. John’s, 2014. This entry was posted in Archival Moments and tagged buxom, caribou pin, lassies, Regiment, Regimental hay, scotland, wollen helmet on February 27, 2016 by Larry Dohey. What happened to the ‘hockey’ Rover? Hockey has evolved over the years and one of the more profound changes that came about during the First World War was the introduction of six aside hockey. Previous to the war years, Newfoundland teams put seven players on the ice. The additional player was known as the “ROVER’. The rover did not have a set position per se, but rather “roamed” about the ice. There were two other positions that fans would have known, the “POINT” and “COVER POINT”, eventually they became today’s Defense. In the winter of 1917 a contingent of the Newfoundland Regiment departed Newfoundland by boat destined for Halifax where they were to join a flotilla destined for England. On route to Halifax it was discovered that all of the men had contracted mumps and or measles. So as not to infect the rest of the troops the Regiment was sent from Halifax to Windsor, Nova Scotia where they were to recuperate. Among those aboard ship were some of the best hockey player’s that the Dominion of Newfoundland had ever produced. Known as the Windsor Contingent of the Royal Newfoundland Regiment some of the hockey players in quarantine were H.G.R. (Harry) Mews, Charlie Strong, Ernie Churchill, Rex White, Duke Winter and Lionel Duley. The team played a series of games in Windsor during their ten-week quarantine before sailing to England and the trenches of France in April. This was the first time that Newfoundland put a team on the ice playing with six players per side. The Newfoundland players liked the new game. With the rover removed the players had much more ice surface to cover. The game became much faster. In 1918, Nova Scotian teams visited St. John’s and the new rule change was introduced. The change was formally adopted in 1919 by the Newfoundland Hockey Association. The ‘Rover’ was no more. Duley, was Killed in Action in 1918, Strong died of wounds sustained in battle in 1918, Mews returned to Newfoundland and later became Mayor of St. John’s. The St. John’s Ice Caps will be wearing a special jersey to remember the Newfoundland Regiment on February 5th and 6th. On January 14, 2016 with great pride and respect, the St. John’s IceCaps , at The Rooms , unveiled a Royal Newfoundland Regiment tribute jersey to commemorate the 100th anniversary of the Battle of the Somme at Beaumont-Hamel. The logo on the tribute jersey features a black silhouette of a First World War Royal Newfoundland Regimental solider encircled by the words: Royal Newfoundland Regiment 1916-2016. The entire IceCaps team was on hand to model the new jerseys. The IceCaps will wear the jerseys Friday and Saturday, February 5th and 6th versus the Utica Comets. Many in the seats at Mile One will be remembering their ancestors who loved the game. Recommended Archival Collection: The Rooms Provincial Archives – Sports Archives of Newfoundland and Labrador has a substantial collection of photographs detailing the history of League Hockey in Newfoundland and Labrador. This entry was posted in Archival Moments and tagged hockey, puck, Regiment, rover on February 4, 2016 by Larry Dohey.